Does today's card look a little off to you? Too smoothed on the crown? Oddly blended along the logo? 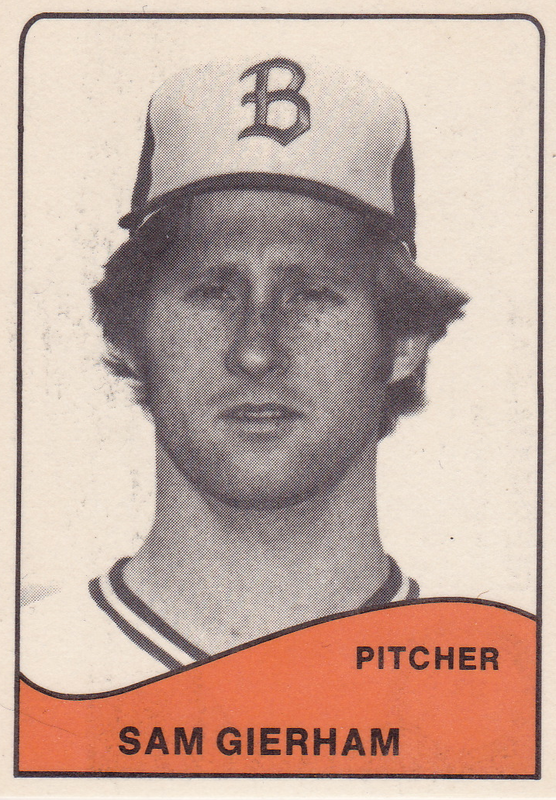 I doubt that TCMA spent precious money on airbrushing--at least nothing like what Topps does every single year--but I could swear there's something unoriginal about Mr. Gierham's visage. 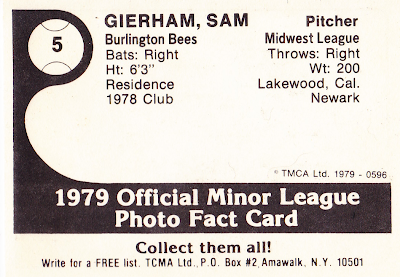 Speaking of that name, "Sam Gierham" doesn't really exist, but Sam Gierhan does, and pitched three years of minor league ball between 1975 and 1979. (There's a two-year gap for 1976-77, which I assume he committed to college studies.) Based on Google results, this TCMA card's the only time a "Sam Gierham" has ever existed. TCMA got Sam's name right on their 1978 Newark Pilots team issue, but neglected to carry over his 0-1 record for this card back. He won a total of 2 games in the minors, both in 1975 rookie league play. 1979 Burlington Bees checklist courtesy of TeamSets4U.com; player names appear correct to me, other than Sam. I was hoping that it was Burlington, Vermont. Nope, it was Iowa instead. The Bees have had some good players pass through their system. Long time until now I hear all our names. Glad to bring you all back together again, Mr. Ramirez!